Installing Switch Lite is similar to installing any other WordPress theme. After Downloading you will get a ZIP file . That is your main zip file. Upload it using WordPress's theme uploader and activate it. Depending on your settings, you can immediately see the welcome blog page or landing page. After installating and activating Switch theme, you need to perform the following tasks to enable landing page. Create a New Page . 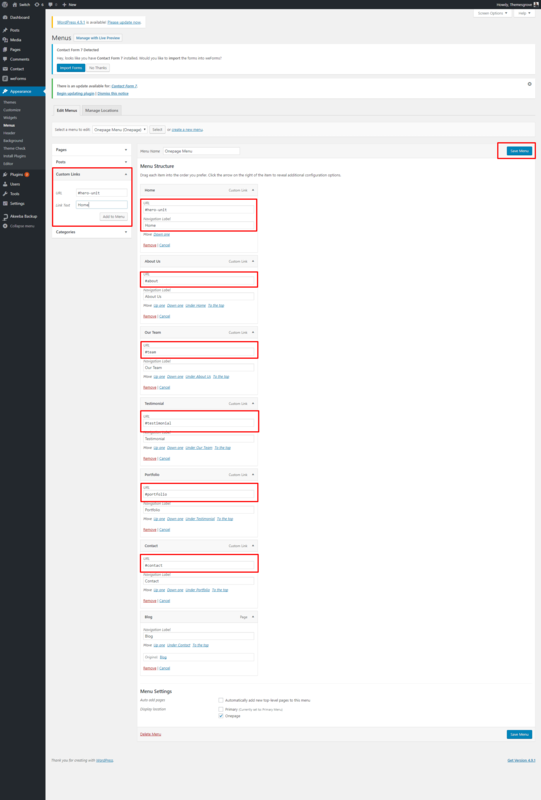 Enter Home page as title and keep the content field blank. Now select "Home page" as page template from the right side page template dropdown menu. Now save/publish it. Go to Settings > Reading. From the Front Page displays section, click on static page, and select previously created "HOME" and Posts page "BLOG" from the dropdowns as shown in the picture below and save. After installating and activating Switch theme, you need to add a menu to complete your default settings. After done click on Custom Links and place id name with hash tag like #hero-unit = Home. Now click on Add to Menu to create your preferred menu. Switch comes with a fantastic a powerful "WordPress Customization" admin panel from where you can update almost every part of the theme. 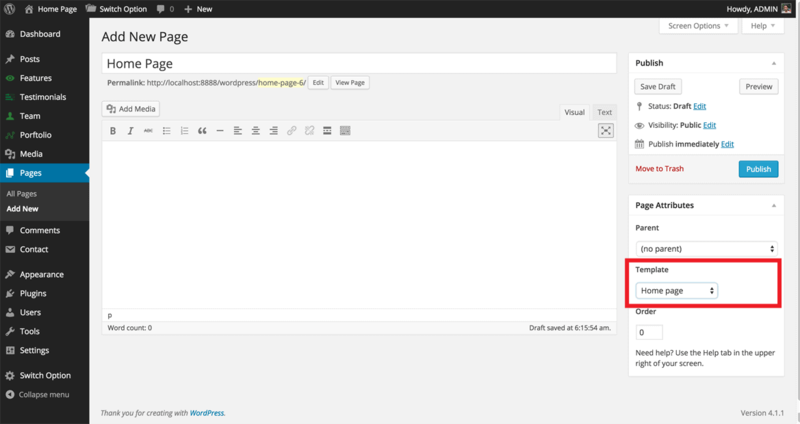 Just go to your WordPress admin panel > Appearance and click on Customize. From the General Settings sections, you can change Preloader Enable/Disable & Body Font Size. The management panel looks like this. From the Site Identity sections, you can change logo. The management panel looks like this. From this section in Home Page Settings > Slider, you can manage the homepage Slider. This section looks like the following screen. Feature section also requires that you create a Home Page Settings > Feature post first, then tune up the look-n-feel from the Feature. settings area. From Home Page Settings > About settings, you can add as many About section details. About Us. looks like the following screen. You can turn it off and also change the title from here. Testimonial section also requires that you create a Home Page Settings > Testimonial items from repeater first, then tune up the look-n-feel from the Testimonial. settings area. Team section also requires that you go to Home Page Settings > Team then tune up the look-n-feel from the Team. settings area. In Switch you can create unlimited portfolio galleries and select any one to display any time. To create a nice Portfolio. Please go the Home Page Settings > Portfolio click on. From contact area, you can specify your Contact details as well as who will receive the contact emails. You can also specify the google map. You will get a shortcode from contact from 7 Or weForms. Just copy it and paste to customization contact option Please go the Home Page Settings > Contact click on. when you install the theme it requires a plugin called contact form 7. Just install that plugin and open it. You will get a shortcoad . please copy that code and paste it into Dashboard admin > Contact/weForms . In Switch you can put your copyright. To create a nice Footer. Please go the Footer click on.